Monday, November 10, 1913: The first snow of the Winter lay upon the ground this morning. I was rather surprised when I looked out of my window and saw that the earth was clothed in white. Was pretty cold today. Hugged the stove part of the time. Posted on November 10, 2013 November 9, 2013 by SherylPosted in OtherTagged family history, genealogy. Love the table in that photo. So practical. I like grandma’s description “clothed in white”. I love wood heat – it truly warms you up! 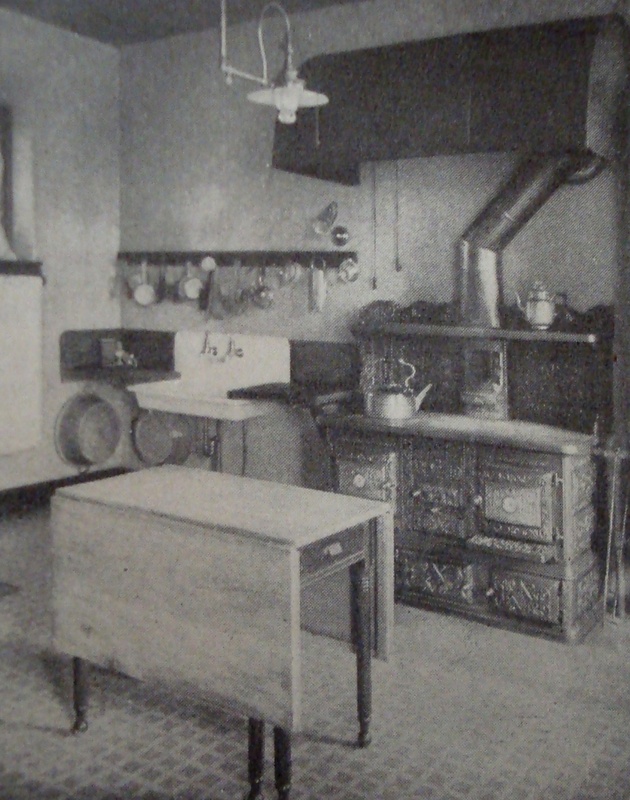 Yes, the kitchen was probably the warmest room in the house. I had a little cast iron model of a stove like that as a kid. Imagine my surprise when one day I realized that it was just like the real one at my great-grandpa’s farm! Love backing up to a wood stove or fireplace! So interesting to experience your Grandma’s winter 100 years ago. I love our wood stove today, but wish I had a fuzzy furry pup to hug too. I can relate. I am always hugging stoves. I love radiant heat. I caught up on your grandmother’s entries. She seems to be writing more. Definitely brings back memories of cold winter days in Iowa. We had friends who had a big pot-belly stove. I don’t think I would have wanted to hug it, but it was really nice to stand right up close to it. I love hat expression: hugging the stove!